This article is about the human kingdom. For the region of the same name, see Gilneas. For the city, see Gilneas City. For other uses, see Gilneas (disambiguation). The kingdom of Gilneas (pronounced "Gil-NEIGH-uhs"), or the Gilnean kingdom, is one of the seven human kingdoms and is located in the peninsula of Gilneas, situated south-west of Silverpine Forest on the continent of Lordaeron. It is ruled by King Genn Greymane of the Greymane family. After the events of the Cataclysm, Gilneas rejoined the Alliance, and they have been trying to reclaim their homeland ever since. The nation's colors are described as a red design consisting of a circle with three vertical lines, akin to lances, and another line bisecting the circle itself, all set within a field of gray. The human kingdom had supported the Alliance during the Second War, but King Greymane had no qualms about severing all ties to the outside world when it became clear that the Alliance needed Gilneas more than Gilneas needed the Alliance. Unbeknownst to the rest of the world, darkness fell on Gilneas after the Greymane Wall's gates had been closed, and the worgen curse ravaged the nation. Before long, Gilneans were fighting against Gilneans in a bloody civil war that left the kingdom in tatters. Remarkably, the people of Gilneas have somehow managed to hold on to the last vestiges of their humanity... for now. Gilneas is a large peninsula that juts into the sea south of western Lordaeron. Silverpine Forest lies to the north-east and Kul Tiras awaits across the sea to the south. The kingdom was founded following the splitting of Arathor and besides the peninsula, the kingdom also included the island of Zul'Dare, and formerly held lands in southern Silverpine Forest including Pyrewood Village and Ambermill. The southwestern reaches of Hillsbrad Foothills in the area around Azurelode Mine were also part of Gilneas. Its king, Genn Greymane, never ardently supported the Alliance of Lordaeron in the Second War. Thus, after the war, he constructed the Greymane Wall: a massive barrier spanning the entire northern border. The enormous wall barricaded Gilneas from the rest of Lordaeron for around two decades. It was later discovered that the 'worgen curse' has swept mercilessly across the nation, eventually turning nearly all of its inhabitants into savage beasts. Escalating tensions among the survivors escalated into bloody civil war that all but wrecked the nation. Following the Cataclysm and an invasion by the Forsaken, some of these Gilnean worgen have regained their free will. After Gilneas fell to enemy hands, Gilneas rejoined the Alliance. Gilneas' borders prior to the First War. Following their victory in their war against the trolls, the empire of Arathor entered into a period of prosperity and growth. After the death of King Thoradin the empire began to expand, founding new city states in the wilderness - including Gilneas. Each city grew and prospered, Gilneas and Alterac developed strong armies which explored the world. Over time the power of Gilneas and the other city states grew as that of Strom waned, eventually they developed their own customs and beliefs and the empire splintered into independent kingdoms. Under the rule of King Archibald, the nation thrived, evolving into a formidable middle-power capable of rivaling even Kul Tiras or Stromgarde. By the start of the Second War Gilneas had become recognized as a significant entity in the political landscape of Lordaeron. Emboldened by this fact, the kingdom's ruler, Genn Greymane, was not a strong supporter of the Alliance, believing that his own armies would be more than enough to deal with any threat. However, wanting to ensure trade relations with the other kingdoms, Genn sent a token force to assist the Alliance. Shortly after the Horde was defeated, Greymane pulled his nation's support from the Alliance, refusing to spend his nation's resources on keeping the orcs alive in internment camps or in rebuilding other nations devastated by the war. Gilneas, along with Stromgarde, in fact led the outcry over the decision to not execute their defeated enemies. Some time after the Second War, Greymane constructed the Greymane Wall — an enormous stone barrier that now separates Gilneas from Lordaeron. Attempting to forever remove his nation from what he considered "other people's troubles", he barricaded the majority of Gilneas behind the Wall. No one, not even other humans were allowed to enter Gilneas. The lands of Lord Darius Crowley including Pyrewood and Ambermill were notably separated from their liege and nation by the Wall, effectively ceded to Lordaeron. The Greymane Wall even remained closed to human refugees begging to be allowed in during and after the Scourge's invasion of Lordaeron. The status of Gilneas became unclear to the outside world. At the peak of their strength, the Scourge relentlessly assaulted the Greymane Wall and threatened to devour all Gilneas. King Greymane's armies held the wall for days against a massive sea of undead hordes, but for every undead that fell, another took its place. In a desperate attempt to hold the seemingly-unstoppable Scourge at bay, Greymane ordered his court archmage, Arugal, to unleash a 'secret weapon' against the Scourge — the worgen, who had been contained for millennia in the Emerald Dream. Unfortunately, after attacking the Scourge, the worgen turned on the Gilnean soldiers, infecting them with their Curse, and began attacking other humans living in Silverpine Forest. Before long the affliction had advanced through the legendary barrier and was gradually eating away at Gilneas' humanity. As reports of strange attacks and disappearances rose, fear took root in the hearts of Genn's people. Gilneas was shielded from the rest of the world, by the Greymane Wall by land and by its high cliffs and treacherous reefs by sea. Refugees and other nations long entreated Gilneas for aid, but these unfortunates never so much as saw a Gilnean. Many became easy prey for the worgen that occasionally strayed south from Shadowfang Keep. For many years King Greymane forbade any attempt to leave the self-isolated, and all ports were closed, leaving sailors and people of other nations stranded in Gilneas (such as Tobias Mistmantle, and the pirates of the Brashtide Crew). Gilneans that were themselves locked out of their homeland were a rare sight, but not unknown (such as Baron Longshore, captain of the pirate ship "Heedless"). While Greymane's efforts to stem the tide of the Scourge kept Gilneas from the grasp of the undead, the Greymane Wall inadvertently subjected the Gilneans to a dark fate all the same. Many fell under the worgen curse, as it did with their neighbors to the north in Silverpine before them. A small group of soldiers known as the Gilneas Brigade joined the Human Expedition led by Jaina Proudmoore during the Third War, but these were actually sent by Lord Crowley as an act of defiance against Genn. Although once a close friend of Genn Greymane, his staunch isolationism led Lord Darius Crowley to eventually take up arms against his king. Leading his armed supporters into Gilneas City in an attempt to depose King Genn, a bloody civil war erupted between the two factions, pitting Gilnean against Gilnean, brother against sister. The so-called 'Northgate rebellion' officially ended when Crowley and his leading allies were captured by Greymane's forces, although rebels and their sympathisers continued to hoard weapons and supplies around Gilneas. Political divisions had led to a deep and bitter hatred between 'rebels' and 'royals', something that has only just begun to heal with the Gilneans' focus shifting to their common enemies. Refugees from Lordaeron and neighboring lands tried to enter the kingdom, but were stopped by the then-closed Greymane Wall. Those refugees were not killed when the Scourge rampaged the land were presumably later killed by the Forsaken and the worgen of Shadowfang Keep. The Gilnean peninsula after the Cataclysm. The Forsaken Invasion of Gilneas. Unbeknownst to many of the kingdom's citizens, a war between beast and man raged within the worgen themselves. To compound the worgen threat, the Forsaken started battering at the nation's gates in a bid to conquer Gilneas. Under orders from Garrosh Hellscream, now Warchief of the Horde, Sylvanas Windrunner was commanded to conquer the lands of Gilneas to secure resources and its safe ports. Sylvanas had her own objective – the retrieval of the Scythe of Elune, an artifact capable of summoning complacent worgen that could spread their curse to all humanity. Due to the efforts of the ancient 'Alpha Prime' of the worgen, Ralaar Fangfire, the worgen epidemic grew with fervor. Ultimately his Bloodfang pack of wild worgen launched a massive attack on Gilneas City, overrunning the kingdom's capital. Crowley and his Northgate Rebels were released from Stoneward Prison by Greymane's edict and quickly agreed to give aid to King Genn, who had ordered the evacuation of Gilneas City to Duskhaven. In order to divert the worgen's attention from the fleeing citizens, Crowley led a group of Gilneans to stand against them at Light's Dawn Cathedral. Crowley and his followers were overwhelmed, and became worgen themselves. Only with the aid of a night elf priestess Belysra, a secret counsellor of Greymane, were the cursed Gilneans shown a way to retain control of their human minds once transformed into worgen. Many, however, remained feral and under the sway of Alpha Prime, an ally of Sylvanas, until his death at Tal'doren. Finding a short-lived refuge in Duskhaven, Krennan Aranas, Greymane's court alchemist, managed to restore temporary sanity to a number of captured feral worgen. The Gilneans' respite was to be short-lived, as the Cataclysm destroyed some of the jagged reefs that protected Gilneas from sea and breached the famed Greymane Wall itself, allowing the Forsaken to pour into Gilneas by land from Silverpine as well as land at Duskmist Shore. As the Forsaken invasion progressed, the whole south-west of Gilneas began collapsing into the sea, destroying Duskhaven. Gilnean survivors fled to abandoned Stormglen Village as Greymane and Lord Godfrey traveled to Tal'doren to ask Darius Crowley and other worgen healed by the Night Elves to help unite Gilneas against the Forsaken. Due to Lord Godfrey's tyrannical command, Crowley was hesitant to accept. Greymane told Crowley that he is asking him as a friend and not as a king, and after revealing that he too had succumbed to the worgen curse, they agreed to join forces. Though the Gilneans, worgen and human alike, led a valiant attempt at driving off the Forsaken by reclaiming occupied Gilneas City, Horde reinforcements and the use of the Forsaken's Blight would soon overwhelm them. With his son Liam killed by Sylvanas herself, Genn decided to seek sanctuary in Darnassus, abandoning his beloved kingdom, but one day return to reclaim Gilneas. Driven by their curse and the threat of the Forsaken, Gilneas was finally driven back into the Alliance's fold, owing a great debt to the night elves who helped heal the minds of many who fell victim to the worgen curse. Lord Crowley and his loyal worgen; the Gilneas Liberation Front, have renewed the war against the Forsaken, advancing as far as northern Silverpine Forest. With the aid of a gnomish submarine used to break the Horde's blockade of Gilneas, the elite 7th Legion spearheaded a vast Alliance offensive to reclaim all of Lordaeron from the Forsaken, starting with Gilneas The combined forces of the Alliance (including Gilnean and now-allied Bloodfang worgen) quickly bested the Forsaken occupiers of Gilneas City, eventually pushing them past the Greymane Wall. However, the Horde managed to rally in Silverpine, holding back the 7th Legion and enabling the Forsaken to resurrect Lord Godfrey as one of their own, a fact that none of the Gilneans were aware of. Sylvanas Windrunner's use of the val'kyr to resurrect fallen humans as allies forced the Alliance to rely on soldiers of other races. Crowley later surrendered to Sylvanas after she took his daughter hostage, threatening her with undeath. This signaled an end to the Alliance offensive in Silverpine, although the Bloodfang Pack expanded their activities into the Hillsbrad Foothills. Meanwhile Lord Godfrey rebelled against Sylvanas and killed her (although she was quickly resurrected) and took over Shadowfang Keep as an independent power. Sylvanas returned to Undercity to recover. At some point, a black drakonid named Creed disguised as Lord Hiram Creed and his Blackhowl forces took control of Gilneas. Then the Alliance was constantly under assault by the Horde as the Battle for Gilneas raged on. After the defeat of Garrosh Hellscream, Varian Wrynn said that they would cleanse Gilneas and keep Sylvanas Windrunner at bay. Gilneas participated in the Battle for Broken Shore. They are later responsible for the establishment of Greywatch, led by the King himself. Following this, the Gilneas Brigade comes to blows with the Horde across the isles, battling with the Queensguard for control of the Warden Towers spread across the regions and leading the search for the Aegis of Aggramar. By the time of the end of the Argus Campaign, the kingdom was referred to as fallen, with nothing but "wind, sorrow and ruin" in the land. When Genn arrived at Stromgarde Keep before the events of the Gathering, he told Anduin that both kingdoms were now in ruins, with Gilneas being home to the Forsaken and Stromgarde being overrun with criminals, ogres, and trolls. Gilneas participated in the Battle for Lordaeron. The Bloodfang Pack also established a foothold once more on Fenris Isle after defeating Deathstalker Hayward, leading to the Forsaken needing to pull their forces out of position in order to evacuate across the Lake. At the same time, Darius Crowley is leading an offensive into Hillsbrad. The 7th Legion has also sent aid to Gilneas, led by Captain Tobias Zaren (who has replaced Pietro Zaren), surrounding Shadowfang Keep, which is in the hands of Forsaken Apothecaries attempting to unleash a much more potent strain of blight upon the Gilneans to the south under the leadership of Chief Plaguebringer Harris. The Horde also moves towards the Arathi Highlands and attempts to take control of the city of Stromgarde in order to prevent the Alliance to obtain full control over the Eastern Kingdoms, and also to use Stromgarde as a launching point to attack the restored Gilneas. After Stormwind refused to send aid to Darkshore, due to their forces being spread too thin, Gilneas opted instead to aid the Kaldorei. King Greymane sent a large force, led by Lorna Crowley and Princess Tess Greymane to aid their allies on their warfront; as well as to show the Alliance had not abandoned the night elves. He stated this was to repay the elves for everything they had done for Gilneas. Two human Gilneans in conversation. A person from Gilneas is referred to as Gilnean. Like most humans, they typically revere the Holy Light, though some formerly reclusive ruralists practice a form of druidism. Such people were known as harvest-witches by the majority of the population. It is referred to as the old ways. Free from outside influence, the kingdom of Gilneas had relied only on the indomitable spirit and tenacity of its citizens to make its own destiny in the world. Gilneans have a culture of self-reliance. They are proud, stubborn, and loathe to accept the aid of outsiders. Of late, however, a series of events that occurred during the Cataclysm has shaken Gilneas to its core. Recognizing the evil and chaos that had taken over the world, the Gilneans have begun to acknowledge that they serve an important role in safeguarding the sanctity of Azeroth and in doing so, have embraced the Alliance cause of fighting for a just and peaceful world. Now, these self-disciplined worgen and tenacious humans have rejoined the Alliance as powerful allies, prepared to fight to keep their humanity and their place in society. It is tradition that a small memento be buried on top of a Gilnean's graveyard, beneath the shallow earth. The wolf appears to be a common symbol of Gilneas, and a wolf skull adorns its coat-of-arms. Gilneas' flag from Warcraft II. Despite being described as a faction in the Warcraft II: Tides of Darkness manual, Gilneas was never actually seen fighting in the game. In the Warcraft III: Reign of Chaos Orc Campaign: The Invasion of Kalimdor in Chapter Three: Cry of the Warsong, one of the human factions you face has the force name Gilneas Brigade, implying that people from Gilneas traveled to Kalimdor with Jaina. It was later revealed that they were sent by Lord Crowley. The Greymane Wall in World of Warcraft as seen prior to patch 4.0.3a. The Greymane Wall, in the south of Silverpine Forest, has been in the game since release, but Gilneas itself remained a closed zone. With the Cataclysm expansion, Gilneas was finally opened to players as the heavily-phased level 1-12 starting area of the new playable worgen race. Players enter the story as a human. The level 1-5 quests take place a year before the Cataclysm, and will teach them how the worgen curse came to be, how the humans of Gilneas came to be affected by it and lastly with the player him/herself being infected with the worgen curse. After a cutscene, players will be in worgen form and the game time skips to just before the Cataclysm. For the remainder of the starting experience, players will experience the dual threats of the effects of the Shattering upon Gilneas and the Forsaken siege. An offer of aid from a night elven druidic sect brings Gilneas into the Alliance, which serves as a counterpart to the introduction of the Horde-allied Goblins of Kezan. In-game, Gilneas appears to be a dreary and rainy territory, reflecting the cursed nation itself. The Greymane Wall received a graphical update to match the new style of Gilneas (a regency style). It must also be mentioned that, much like when Quel'Thalas was introduced in The Burning Crusade, the peninsula of Gilneas has a considerably different landmass than it does on pre-Cataclysm maps, which appeared as a small, thin peninsula roughly the same size and shape as Silverpine Forest to the north. After Cataclysm, the Gilnean peninsula appears slightly shorter but significantly wider (even accounting for the land that sinks into the ocean during the worgen starting experience). Genn Greymane is still alive, being among the first NPCs encountered by worgen players. After the player's transformation into a worgen, Greymane is seen advising Krennan to give the player a treatment for the worgen curse. Outside the battleground, Horde players are sent into a phased version of Gilneas from quests in Silverpine to stop the worgen and fortify their hold on the kingdom; an effort that ends up failing and players witness Gilneas' reclamation by the Alliance (thus setting the basis of the Battle for Gilneas). One of the new battlegrounds in Cataclysm, the Battle for Gilneas, and features the ongoing siege of Gilneas by the Forsaken following the Silverpine quest chain and the eradication of all Forsaken land bases by the Alliance in Gilneas. The unphased version of Gilneas, Ruins of Gilneas, is devoid of any life except for a few critters. The worgen curse that started from Shadowfang Keep and swept across Gilneas left its people irrevocably transformed. Almost the entire human population has been turned to the beastly worgen, a humbling failure for Genn Greymane in his efforts to keep his people safe. The reaction of the people to this change will likely be greatly varied, and has yet to be revealed. Preliminary dialogue from Cataclysm has revealed that Gilnean mages and healers went to great strides to fight the affliction. Gilneas has undergone deep changes in the wake of its cursing, and while the people maintain their free will, the impact of the curse remains to be seen. The forsaken, led by Dark Ranger Thyala, have begun the Invasion of Gilneas. Red Shirt Guy: In Gilneas, the questlines end with the strong feeling of to be continued and that we're going back, and the only other zone in the game that had that same type of ending was Hyjal, and we did go back to Hyjal two patches later, so does that mean we're also going back to Gilneas? Dave Kosak: Two patches later, maybe? ...Maybe, back to Gilneas? I don't know. You know, the- the, uh, Gilneans have such cool architecture and such a cool vibe to it, and it's really hard just because of the nature of their story, we can't really incorporate that outside in the rest of the world, it's hard to do. So it'd be fun to go back to Gilneas and really kind of reclaim that. I don't think it's on the cards right away, but its a really, we just love the feel of that area and everything that they're about. It is later that after the defeat of Garrosh Hellscream, adventurers would speak to Varian Wrynn about the future of the Alliance. He said that they will cleanse Gilneas and keep Sylvanas Windrunner at bay. The Gilneas area is still plagued but pockets of safety exist. By Battle for Azeroth, the kingdom appears to have been restored enough to the capacity that it requires Stromgarde to be taken by the Horde before they can assault it. In addition, several forces have seemingly already mobilized from Gilneas, such as the Bloodfang Pack, whom claim Fenris Isle again, and Darius Crowley, who leads an assault into Hillsbrad. Lord Genn Greymane, a brawny warrior who may be in his seventies, has ruled Gilneas for decades. Greymane never supported the Lordaeron Alliance in the Second War and argued against its existence from beginning to end. In his own words, he despised the orcs and the Alliance stating that the last thing Gilneas needed was sponges from other nations drawing from their resources, Dalaran wizards meddling with their affairs, and someone else's enemies killing their own soldiers. Gilneas was its own nation and it would always be. Genn Greymane owned the entire peninsula even before the Second War. After the Second War, Genn and his people constructed the Greymane Wall, not allowing anyone in or out. None knows what has been transpiring there ever since. During the Third War, refugees from the north camped at Greymane Wall, pleading to be let inside. The gates remained closed, and undead patrols slaughtered them. Perhaps something dire has befallen Gilneas. Rumors of what was transpiring there became the subject of rumors throughout the Alliance - the renowned explorer Brann Bronzebeard theorized that it had fallen to the naga as one such example. Ironforge dwarves, seeking allies to help drive the Scourge from Lordaeron, intended to send a diplomatic party to Gilneas. King Magni hired goblin zeppelins to ferry the diplomats and summoned Wildhammer gryphon riders as escorts. Yet no one knew what to expect in Gilneas, so Magni also hired a few trusted mercenaries to accompany his ambassadors. Like their leader, Gilneas' people are burly and gruff. Extremely isolationist, they supported the Greymane Wall's construction. They speak common, and have their faith in the Holy Light. Gilneas is the setting of the Witchwood expansion for Hearthstone. In this scenario, Gilneas City was apparently restored, the Blackwald was twisted by Hagatha the Witch into the Witchwood, Prince Liam returned as a ghost, the Blackhowl joined the Alliance, and Gilnean citizens and allies engaged in hunting corrupted monsters such as treants, aberrations and others. Gilneas participated in the council that would eventually lead to the creation of the Alliance. The Gilneans' clothing, weapons, architecture and accents have great Regency connotations, which along with Gilneas' cold and rainy weather of the peninsula, seems to have been inspired by nineteenth century London. It is said that at one time the kingdom of Gilneas had land only at the tip of the peninsula that bears its name. Before the announcement of the draenei as the Alliance race in World of Warcraft: The Burning Crusade, there was speculation that the worgen and Gilneas would enter the game at this stage. The rumour again came out in July 2009 with the revelation of worgen Hallow's End masks. It was finally confirmed at BlizzCon 2009. 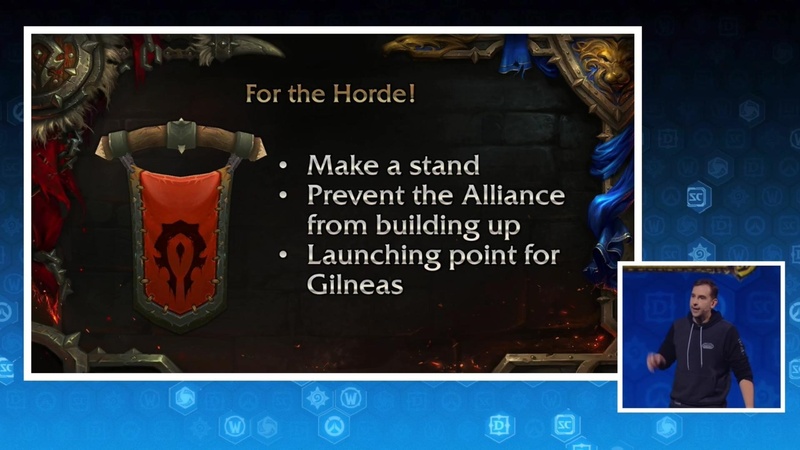 In response to a question at BlizzCon, Metzen mentioned that they had "forgotten" about Gilneas. Later, in an interview at 2009 New York Comic Con, he mentioned that Blizzard has some "very, very, very interesting plans for Gilneas", but he would not reveal any further details. It was revealed to be that the Gilneans had turned into worgen and have now joined the Alliance. A coin fished from Dalaran's fountain called [Genn's Copper Coin] reads "Pah, the fountains in Gilneas could grant ten times as many wishes as Dalaran's!". [Gilneas Sparkling Water] can be purchased in the Old Hillsbrad Foothills section of the Caverns of Time instance. This water replaces [Purified Draenic Water], which wouldn't have been found on Azeroth at the time the instance takes place. The tents in Warcraft III have the same symbol that banner of Gilneas from Warcraft II had. The same symbol is present on the Worgen icon, but is missing from the Gilnean flag. Gilneans' clothes appear to be styled similar to the Regency Era. This, combined with the cold, gloomy and rainy atmosphere of Gilneas, would appear to indicate that Gilneas is based on nineteenth century England. Some Gilnean buildings, such as Greymane Manor and in Greymane City, have "onion domes" on them, possibly indicating a Russian influence in elements of their architecture. Among the communities created by Gilnean sailors are Surwich, Bradensbrook, Havenswood and even the nation of Kul Tiras. Gilneas' borders, prior to the construction of the Greymane Wall and the Scourge invasion causing them to lose their ability to hold regions beyond the wall, once spanned into the southern half of Silverpine and into western Hillsbrad. Initial concept layout. (seen at BlizzCon 2009). Layout of the Gilneas Peninsula as of Blizzcon 2009. A poster warning Gilnean citizens of the worgen. A Gilnean house in art. The icon for the playable worgen. A group of ogres may have invaded the land during the Second War or in its aftermath. Alternatively, they could have arrived via ships after the wall was built. Despite the iconography of the wolf being common in Gilneas culture, there are no wolves in Gilneas proper, unlike Silverpine Forest to the north. Having been walled off from the rest of Lordaeron it is possible that wolves were hunted to extinction (as happened in 17th century Britain), since Gilneas seems to be currently home to both sheep husbandry and a hunting culture. ^ Quote by Enormous Shawn Stooker: "We used to roam the seas... 'til that damned King Greymane shut down the harbors in Gilneas! If it weren't for him, we wouldn't be..."
^ Races of World of Warcraft - Worgen. Archived from the original on 2012-06-04. ^ Quote by Genn Greymane to Tyrande Whisperwind after  The Howling Oak: "Not at all, priestess. We are very grateful for all that you've offered us here." ^ [Orders from High Command], from  On Whose Orders?